it’s moments like these that make me re-committed to not blogging. yes, you read that right: NOT blogging. i know this makes all two of my remaining blog readers sad, but that conversation with a grad school crony began with the red sox and the world series and going to game 6 at fenway and me wanting to know if i might be able to see her and her husband on TV when it took a sharp spin into writing land. it shouldn’t have surprised me considering we met in a writing program, but it stunned me with its sincerity and accuracy and vastness. most of all because me tell a funny story? that never happens. i’m just not good with the verbal method of telling stories. 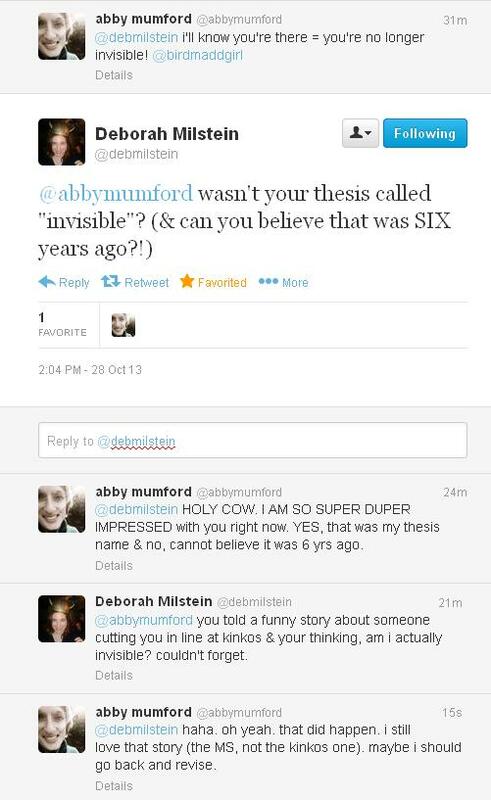 seriously though, what seemed like a little question to deb was a big moment for me because it reminded me i want to write a publishable manuscript. i want to have readers and i want them to remember little bits about my writing, even if it’s pieces i barely remember. even if those tiny particles of memory never reach me, it’s an electrifying thought to think they could be out there. This entry was posted on October 29, 2013 at 8:00 am and is filed under feelings. You can follow any responses to this entry through the RSS 2.0 feed. You can leave a response, or trackback from your own site. But I understand. I’ve had to back off blogging, too, while I drown myself in the new book. If only I didn’t require sleep! Then I’d be able to do it all. I know you too have been away from the blogosphere and I’ve missed you madly but I trust this means more Ciel and her shenanigans?!? If so, I’ll take it! Also, thx for the encouraging words. They are much appreciated.